We love our squashes, and Kabocha in particular has plenty to love about it, compared with some of its more popular cousins like the butternut squash. This very Japanese squash is one of the sweetest squashes in town, and seasoned chefs cook its skin as well, as Vaidyaji does in this recipe, for its nutrients and fiber, not to mention the smooth and delicious taste. 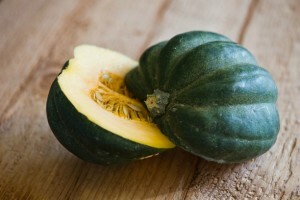 Kabocha is high in fiber, yet much lower than butternut squash on the calorie meter. Its deep orange flesh packs in beta carotene, which spells good news for your eyesight, skin and hair. Our recipe is inspired by the flavors of the Far East, where coconut milk and roasted kabocha mingle with other ingredients of similar character like sage, to create a creamy, buttery and altogether delicious soup. But lest you thought that was the only thing possible, a side pathway lands you with a delightful curry surprise. Perfect for a supper in December, spicy in the right places, warming and very flavorful.